The simplest way to get a decent volume of sound from your iPhone is to connect it to a pair of powered speakers (speakers that include their own amplifier). You can buy speakers designed especially for the iPhone, which use the Dock Connector port for high-quality output. But you can also get good sound using your iPhone with any powered speakers that accept input via a miniplug connector (the size of connector used for the iPhone’s headphones). When you connect external speakers to your iPhone, you have a choice of ports: the headphone port or the Dock Connector port. If possible, use the Dock Connector port rather than the headphone port. You can use it either directly with a speaker or cable that has a Dock Connector, or indirectly by connecting your iPhone to a dock and then connecting the speakers to the line-out port on the dock. The Dock Connector port delivers a fixed output level and better audio quality than the headphone port (whose output level varies depending on the volume setting), so it’s a much better choice. 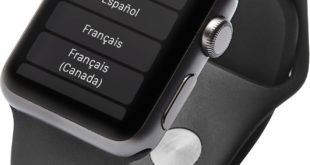 Most speakers designed specifically for use with the iPhone have a Dock Connector that enables them to receive audio at line-out quality and a constant volume. When you need to connect speakers to the headphone port rather than the Dock Connector port, turn your iPhone’s volume all the way down at first. The headphone port puts out up to 60 milliwatts (mW) altogether—30 mW per channel—and can deliver a high enough signal to cause distortion or damage to an input that’s expecting a standard line-out volume. After you make the connection, start playing audio and turn your iPhone’s volume up gradually until you get a suitable level on the input. If you have a good stereo, you can play music from your iPhone through it. In this section, we’ll look at how to connect your iPhone to your stereo using a cable, using Bluetooth, and using a radio transmitter. The most direct way to connect your iPhone to a stereo system is with a cable. For a typical receiver, you’ll need a cable that has a miniplug at one end and two RCA plugs at the other end. Figure 1 shows an example of an iPhone connected to a stereo via the amplifier. FIGURE 1 A miniplug-to-RCA-plugs cable is the most direct way of connecting an iPhone to your stereo system. Some receivers and boom boxes use a single stereo miniplug input rather than two RCA ports. To connect your iPhone to such devices, you’ll need a stereo miniplug-to-miniplug cable. Make sure the cable is stereo because mono miniplug-to-miniplug cables are common. A stereo cable has two bands around the miniplug (as on most headphones), whereas a mono cable has only one band. If you have a high-quality receiver and speakers, get a high-quality cable to connect your iPhone to them. After the amount you’ve presumably spent on your iPhone and stereo, it’d be a mistake to degrade the signal between them by sparing a few bucks on the cable. You can find various home-audio connection kits that contain a variety of cables likely to cover your needs. These kits are usually a safe buy, but unless your needs are peculiar, you’ll end up with one or more cables you don’t need. So if you do know which cables you need, make sure a kit offers cost savings before buying it instead of the individual cables. 1. Connect the miniplug to your iPhone’s headphone port. If you have a dock, connect the miniplug to the dock’s line-out port instead, because this gives a more consistent volume and better sound quality than the headphone port. 2. If you’re using the headphone port, turn down the volume on your iPhone all the way. 3. Whichever port you’re using, turn down the volume on the amplifier as well. 4. Connect the RCA plugs to the left and right ports of one of the inputs on your amplifier or boom box—for example, the AUX input or the Cassette input (if you’re not using a cassette deck). Don’t connect your iPhone to the Phono input on your amplifier. The Phono input is built with a higher sensitivity to make up for the weak output of a record player. Putting a full-strength signal into the Phono input will probably blow it. 5. Start the music playing. If you’re using the headphone port, turn up the volume a little. 6. Turn up the volume on the receiver so that you can hear the music. 7. Increase the volume on the two controls in tandem until you reach a satisfactory sound level. Too low a level of output from your iPhone may produce noise as your amplifier boosts the signal. Too high a level of output from your iPhone may cause distortion. Connecting your iPhone to your stereo with a cable gives you great quality, but it means your iPhone is anchored in place (unless you get a cable long enough for you to roam the room like a 1970s guitarist). If you want to keep your iPhone at hand while you play music through your stereo, try Bluetooth instead. To connect your iPhone to your stereo via Bluetooth, get a device such as the Belkin Bluetooth Music Receiver ($49.95; http://store.apple.com and other retailers). This is a Bluetooth device that connects via a cable to your stereo. You then connect your iPhone to the receiver via Bluetooth and play music across the airwaves. Quality is lower than with a cable, but you’ll probably feel the added freedom makes up for it. If you don’t want to connect your iPhone directly to your stereo system or pay for a Bluetooth receiver, you can use a radio transmitter to send the audio from your iPhone to the radio on your stereo. The sound you get from this arrangement typically will be lower in quality than the sound from a wired connection, but it should be at least as good as listening to a conventional radio station in stereo. If that’s good enough for you, a radio transmitter can be a neat solution to playing music from your iPhone throughout your house. Using a radio transmitter has another advantage: You can play the music on several radios at the same time, giving yourself music throughout your dwelling without complex and expensive rewiring. 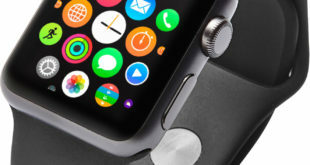 To use the radio transmitter, you connect it to your iPhone’s headphone socket or Dock Connector port, set the frequency to transmit, and then set the music playing. When you tune your radio into that frequency, it receives the broadcast just like a regular radio station. 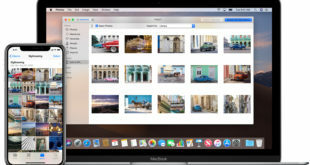 Your iPhone includes a feature called AirPlay that enables it to play music on remote speakers connected to an AirPort Express wireless access point. If you have an AirPort Express (a wireless access point that Apple makes), you can use it not only to network your home but also to play music from your iPhone or your computer through your stereo system. • Connect an optical cable to the AirPort Express’s line-out socket and to an optical digital audio input port on the receiver. If the receiver has an optical input, use this arrangement to get the best sound quality possible. • Connect an analog audio cable to the AirPort Express’s line-out socket and to the RCA ports on your receiver. 2. If your network has a wired portion, connect the Ethernet port on the AirPort Express to the switch or hub using an Ethernet cable. If you have a DSL that you will share through the AirPort Express, connect the DSL via the Ethernet cable. 3. Plug the AirPort Express into an electric socket. You can now play music from your iPhone by tapping the AirPlay icon, the icon showing a solid triangle superimposed on a hollow rectangle, as shown in the lower-right corner of the left screen in Figure 2. 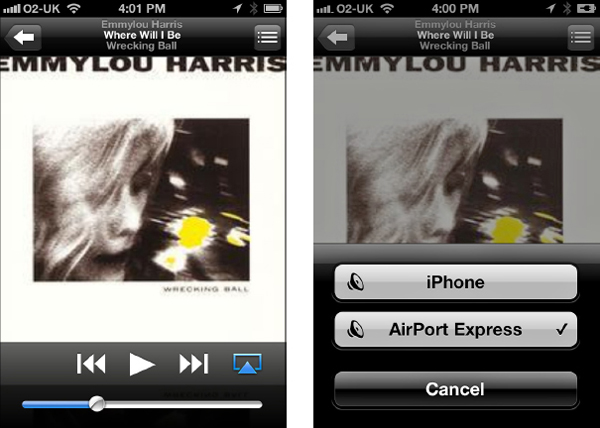 In the AirPlay dialog box that opens (shown on the right in Figure 2), tap the AirPort Express button. FIGURE 2 Tap the AirPlay icon (the triangle and rectangle in the lower-right corner of the left screen) to display the AirPlay dialog box (right), and then tap the AirPort Express button. When you need to switch back to your iPhone’s speakers, tap the AirPlay icon again, and this time tap your iPhone button. To play music from iTunes on your computer through the AirPort Express, you use a similar technique. Click the AirPlay icon near the lower-right corner of the iTunes window to display the pop-up menu with the speakers you can use, as shown here. Then click the AirPort Express item on the menu to direct iTunes’ output to the AirPort Express. 1. In iTunes, click the AirPlay icon to display the pop-up menu. 2. Click the Multiple Speakers item to display the Multiple Speakers dialog box, shown here. 3. Select the checkbox for each speaker set you want to use. 4. Drag the volume sliders to adjust the relative volume of the speakers. 5. Click the Close button (the × button on Windows, the red button in the upper-left corner on the Mac) to close the Multiple Speakers dialog box. When you’re out and about with your iPhone, you probably don’t carry a pair of speakers with you. If you’re somewhere where you can patch your iPhone into a stereo or use AirPlay to play into an AirPort Express, you’re set. But otherwise, you need to rely on your iPhone’s speaker, which doesn’t have the muscle for playing to a group of any size. Here’s a quick remedy: Grab a pint glass and make sure it’s empty and (preferably) clean and dry. 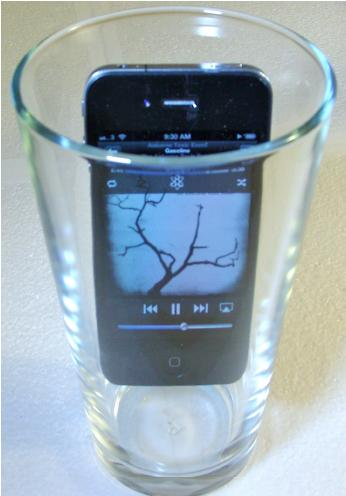 Set your music playing, and then place your iPhone in the glass, as shown in Figure 3. The glass acts as an echo chamber, giving you about double the volume, and considerably more bass. Quality is pretty good, considering what you’re using. FIGURE 3 Use a pint glass as an echo chamber to boost your iPhone’s output. When you finish playing music with the pint glass, use it for its normal purpose.